Senior Caleb Suderman is happy he is able to finish school and complete graduation on time, despite his new and busy schedule as a professional hockey player. Submitted photo. 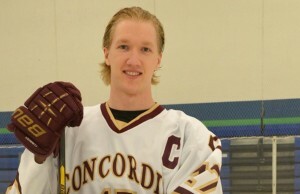 Cobber hockey player, Caleb Suderman, said it was a “dream come true” to be playing professional hockey. The senior from Winkler, Manitoba signed a one-year deal with the Greenville Road Warriors of the East Coast Hockey League back on March 13. The Road Warriors are a minor league affiliate of the New York Rangers of the National Hockey League. The whole process began as an advisor was working with him to sign him to a team. While reviewing some options for teams on the east coast, he was quickly snatched by Greenville. “We were both shocked because it kind of came out of nowhere,” Suderman said. When Suderman was signed on March 13th by Greenville, he had to figure out how to manage school and play professional hockey. “I’m able to do online assignments and see online lectures, which is really convenient.” “Time management is the biggest key for me,” Suderman said. Suderman said it is likely that he will be back for graduation, although he will have to take a few final exams prior to commencement. All contracts for teams in the East Coast Hockey League are for one year, so Suderman will have to show that he is worth resigning for next year, otherwise he could be picked up by a similar club. When asked about the difference between professional hockey and college hockey, Suderman added, “It’s very different. It’s a big jump from college.” Many of the games are within driving distance, but some of the games in the Northeast require a flight to the game. After the season and graduation, Suderman plans to go back to Manitoba to work and prepare for next year. In his eight games played this season for Greenville, he has one goal with twelve shots on goal. The Road Warriors are third in their division with 39 wins and 24 losses.